A review article in the March issue of Gastroenterology discusses different hypotheses about the cells responsible for liver tumorigenesis. The article also reviews the different classes of liver tumors, based on the molecular features, and how these affect patient prognosis. 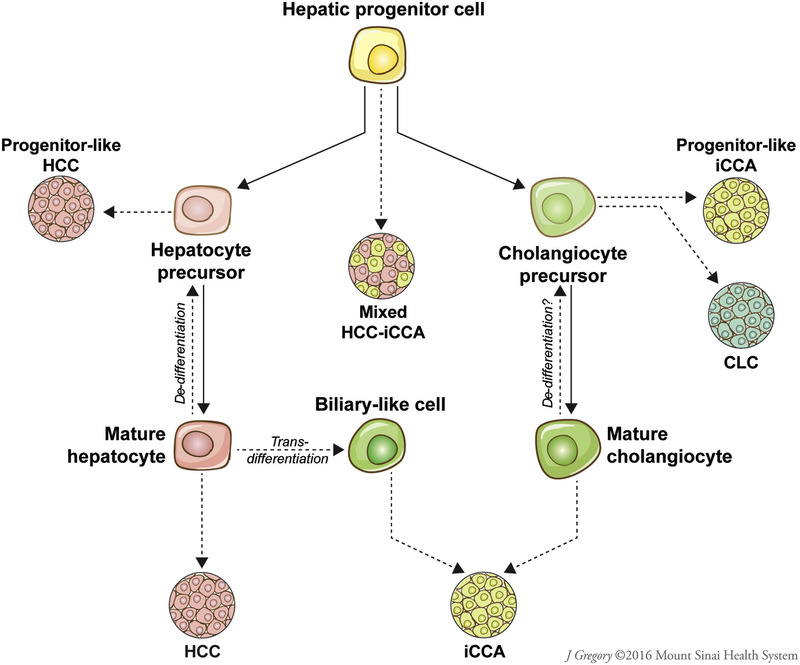 HCC and iCCA can develop via transformation of mature hepatocytes and cholangiocytes. Hepatic progenitor cells (HPCs), their intermediate states, or dedifferentiated hepatocytes can form liver tumors with progenitor-like features, including mixed HCC-CCA, such as CLC. Mature hepatocytes can also reprogrammed into cells that resemble biliary epithelial cells and contribute to development of iCCA. Daniela Sia et al describe the distinct molecular and clinical features of hepatocellular carcinoma (HCC) and intrahepatic cholangiocarcinoma (iCCA), reviewing their similaries in risk factors and pathways of oncogenesis. The authors also describe molecular features of uncommon liver tumors, including mixed hepatocellular cholangiocarcinoma (HCC-CCA), fibrolamellar HCC (FLC), and the pediatric neoplasm hepatoblastoma. Sia et al explain that adult hepatocytes can transform directly into HCC cells (via a sequence of genetic alterations), dedifferentiate into hepatocyte precursor cells (which then become HCC cells that express progenitor cell markers), or transdifferentiate into biliary-like cells (which give rise to iCCA) (see figure). The authors summarize experimental evidence implicating adult hepatocytes as the cell of origin in liver cancer. However, Sia et al explain that progenitor cells can also give rise to HCCs and iCCAs with progenitor-like features. Adult cholangiocytes, which lack the plasticity and transforming capacity of hepatocytes, give rise to only iCCAs. The authors summarize factors in the liver microenvironment that contribute to tumor formation, including changes in the extracellular matrix of the liver, signaling between parenchymal and nonparenchymal cells, and immune dysfunction. 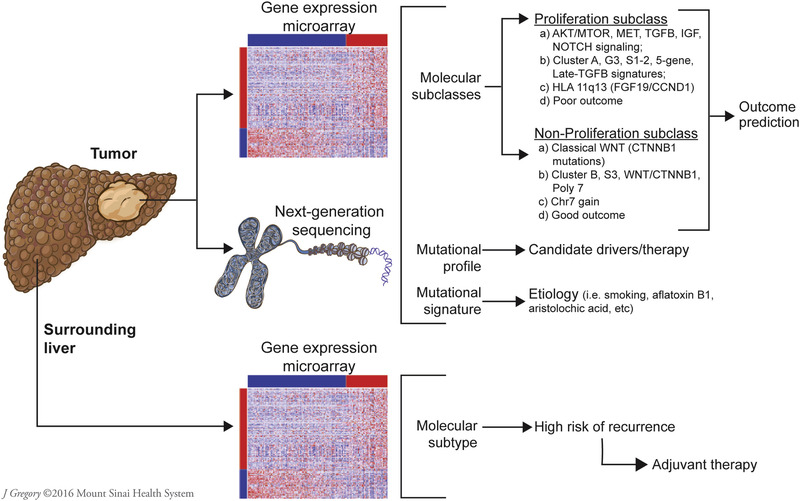 High-throughput technologies, such as combinations of single nucleotide polymorphism arrays and transcriptomic and exome sequencing analyses, have identified molecular subtypes of HCC, with distinct oncogene signaling pathways and recurrent mutations. Sia et al describe the 2 major subgroups of liver tumors, broadly termed proliferation and nonproliferation, which correlate with clinical and pathology features, etiology, and patient outcomes. Sia et al explain that there are also molecular subclasses of iCCA, which were only recently recognized as a distinct entity with its own staging system and practice guidelines. Two main subtypes of iCCA (proliferation and inflammation) have been proposed based on an integrative analysis of whole-genome expression patterns, chromosomal aberrations, mutations, and alterations in signaling pathways. 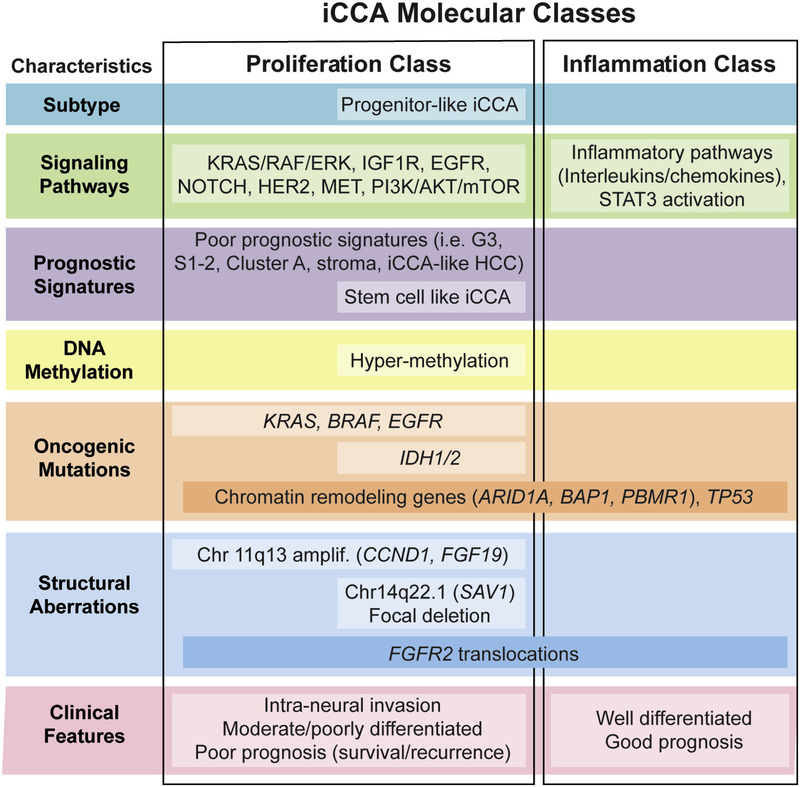 The molecular features of HCC and iCCA can be used in determining patient prognosis, but Sia et al explain that our knowledge of the molecular features of HCC and iCCA have not yet been translated to the clinic, because few studies have linked specific molecular classes of tumors or aberrations to responses to therapy. The authors state that it is important to incorporate biomarker studies into future clinical trials. What is the Incidence of Achalasia?